Heat oil in a pan. Add jeera. When jeera starts spluttering add chopped onions and green chillies. Fry until the onions turn pink. Add ginger garlic paste saute. Add red chilly powder, dhaniya powder, haldi and mix well. Fry for few sec. and add chopped tomatoes. Cook for 2 to 3 mins. and add the chopped cauliflower and potatoes. Mix well, add salt and a cup of water. Close the lid. Cook in a medium flame for about 10 to 12 mins. After the veggies are cooked switch off the flame and take the curry into a serving bowl and garnish with fresh dhaniya leaves. 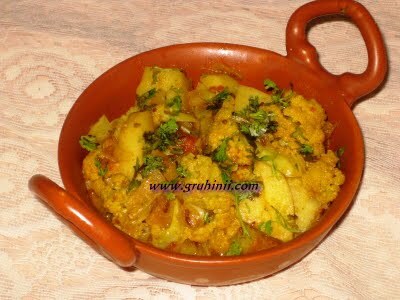 Aloo Gobi ki sabji/cauliflower potato curry is ready...........Serve hot with rotis or chapatis.